Daisy Necklace is a little remembrance of beautiful Spring days and meadows full of daisies. Long associated with childhood, innocence and purity. Remember the days spent playing in the playground, making daisy chains and chanting ‘He loves me, he loves me not’. Remember those childhood days spent plucking petals of a daisy saying chanting those words with each pull. Each of us hoping the last daisy petal reveals, He Loves Me! Similarly, saying ‘This year, next year, sometime, never’, predicted when marriage would occur. A symbol of true love. A little girls dream, capturing the innocence and beauty of childhood. Thousands of years ago, in mythology the Daisy was a sacred symbol of Freya – the Norse goddess of Love. The Daisy is a symbol of motherhood and childbirth. Freya, the goddess, carries the theme of purity and youth. In Victorian times, the Daisy was often paired with the primrose, a symbol of childhood and mother love. 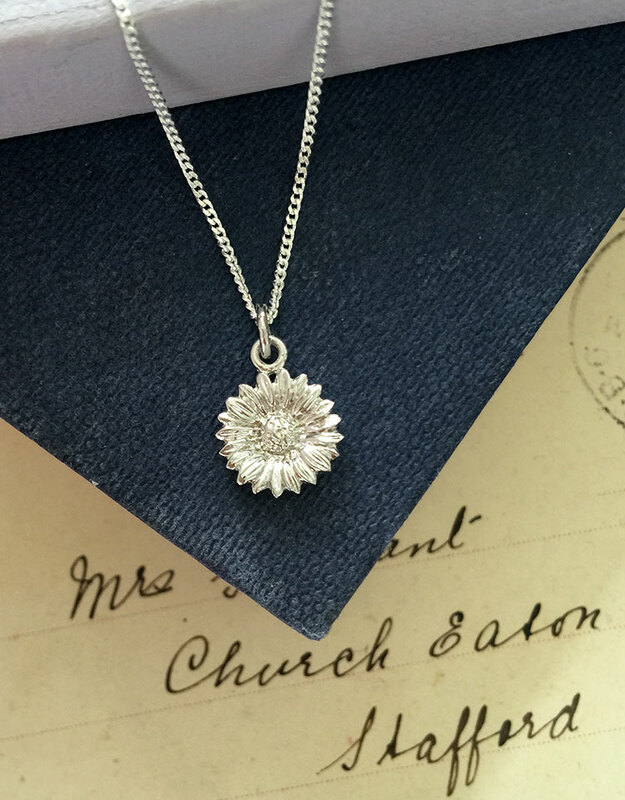 The Daisy Necklace the perfect gift between a mother and child. Today this traditional symbolism continues, with Daisies still often being found in bouquets for new mothers or as gifts for children. In keeping with these love motifs, it was said that whoever picked the first daisy of the season was filled with sentimental desire. It was also believed you heightened the chances of an errant lover’s return if you slept with a daisy root under your pillow. The daisy has a long-lasting body of folklore surrounding it. It is believed that the name for the Daisy derives from the myth of the water meadow nymph, Belidis, who is pursued by the lustful orchard god, turned herself into a daisy to escape. The Daisy has also been believed to get its name from the Anglo Saxon name for the plant ‘daeges eage’, meaning ‘days eye’, associated with the plant’s tendency to only open during sunlit hours. According to an old German folklore, daisies which were plucked between twelve and one o’clock and then dried bring success to any venture. A symbol of luck and love. Daisy Necklace has a hand-textured finish, a delicate piece, goes with everything. The ideal present for a mother, child, or christening gift – a reminder of sunshine days and playing in meadows full of daisies.